It is with heavy hearts that we announce the death of Aiden McCabe, our dear friend, Vice-Chairman and co-founder of the Club. Aiden was a unique person who worked tirelessly for the good of our club and its members, leading always with good humour, kindness and generosity of his time. His enthusiasm was contagious, and he was loved and respected throughout the country by the many clubs for Active Retirement. 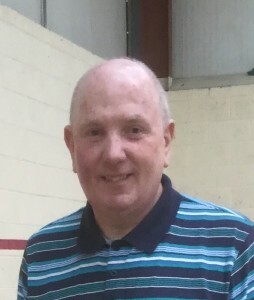 He was always happy to liaise with other clubs to promote the many competitions and events during the year, and his love of bowls, meeting others and positive attitude was an inspiration to us all. Aiden could be relied upon to make sure that club functions were supported one hundred percent by him, even persuading local businesses to donate prizes for us to distribute on our Open Day, and winners could be sure that he had obtained the various trophies and that they were suitably engraved. He was there is the morning to open the gym and roll out the mats, he was happy to guide if a new person wanted to join the club, and was ever welcoming. Aiden was always ready to help people who needed anything, from a car ride to a caring phone call if any member was ill or indisposed. He will be sorely missed and we send our deepest condolences to Janet, his beloved wife, and their family.